After his 2014 remarks, it wasn’t very clear what Billionaire Bill Gates thinks about Bitcoin. Not at least until now. In his recent AMA, addressing a question around Cryptocurrencies, he said that these virtual coins are the direct cause of deaths. “Right now Cryptocurrencies are used for buying fentanyl and other drugs so it is a rare technology that has caused deaths in a fairly direct way,” Bill Gates said. When touching the subject on government intervention, he also added that it’s a good thing that government can find money laundering, tax evasion, and terrorist funding. 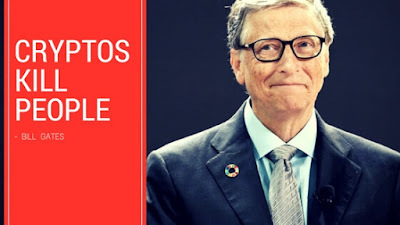 Bill Gates advised everyone to maintain a distance from Cryptocurrencies and Initial Coin Offerings, saying it is very risky given they are built on speculation. Interestingly, in one of his 2014 interviews to Bloomberg, he was pretty positive about Bitcoin, even claiming that the Cryptocurrency is better than actual currency. “Bitcoin is exciting because it shows how cheap it can be,” Bill Gates said in 2014. “Bitcoin is better than the currency in that you don't have to be physically in the same place and, of course, for large transactions, currency can get pretty inconvenient,” he added.